The RDM6014 document reader and imager is part of the exclusive EC6000i Series. It can connect to the most popular POS terminals and its compact design maximizes counter space. 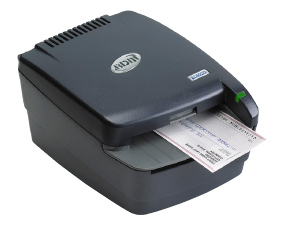 With the RDM6014 you can connect directly to your computer and a scanned image of the check appears on the computer for verification. The EC6000i Series provides superior MICR read accuracy, clear images, and includes MICR and bi-directional drives as standard features. The bi-directional drive provides visual confirmation of each check and allows merchants to easily identify fraudulent check writers.